Ahoy, there! If you are looking for the perfect pair of pirate boots to set off your roguish swashbuckler ensemble, then you have come to the right place. We carry a wide selection of high quality pirate footwear suitable for any character that sails the high seas. These buccaneer boots are made from fine materials like genuine leather and faux leather, and many come in black or brown color options. 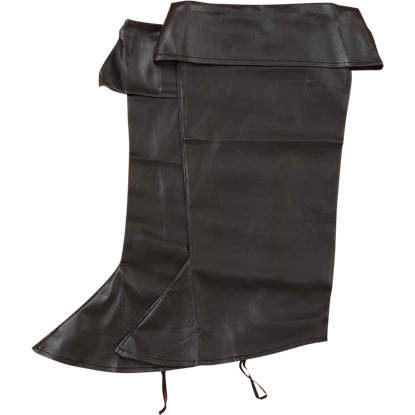 A number of these pirate captain boots feature a folded cuff along the top, and several display large buckles, buttons, or lacings as detail. 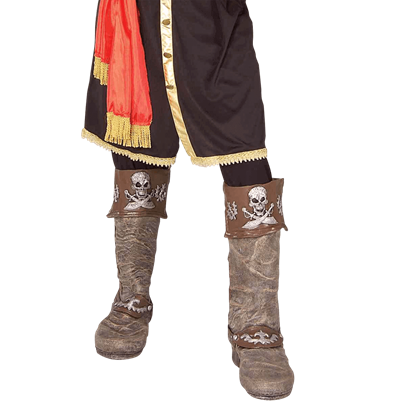 Now you can dress up as Captain Jack Sparrow, Mary Read, Captain Kidd, Anne Bonny, or Blackbeard himself for your next Halloween party or theatrical performance. With a pair of these leather privateer boots, you can look like a positively rakish sailor or a dashing commodore with ease! 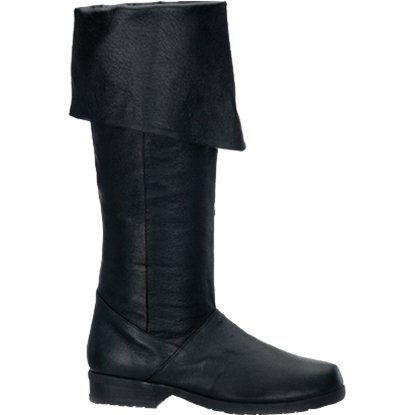 Our Womens Black Raven Leather Boots are a very versatile boot. They will go with just about any style from Medieval to Musketeer. You can wear them as thigh high boots or fold the cuff over and make them knee boots. Perfect for Pirates or Renaissance noblemen, the Buttoned Pirate Boots feature a striking look any man can enjoy. 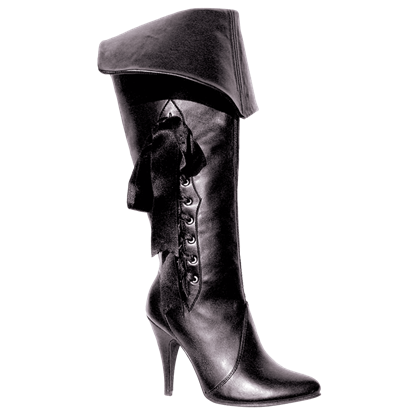 These knee high boots display a convertible upper cuff and a row of decorative silvery buttons along the outer side. The Captain Jack Boots are sure to make any Pirate ensemble a hit! These boots are made from a synthetic leather and come up to the knee. These boots have a 1 inch heel and a non-slip sole. They are available in four sizes. Lead a band of bloodthirsty buccaneers and rule the Seven Seas with the Captain Redbeard Boots as your preferred choice in footwear. This fine pair of period costume boots is suitable for an adventure into the Golden Age of Piracy. Our Cavalier Boots are a soft, stylish, all purpose period boot made of genuine leather. 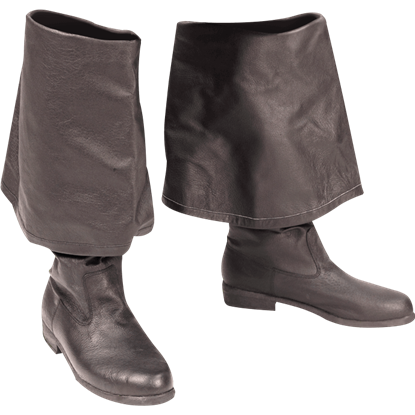 These boots have a fold-over cuff that can be worn up or down. They also have an all rubber non-slip soles and heel. Piracy can run in the family. But if you are child still lacks their proper sea legs, than these Childs Pirate Boot Toppers are the perfect way to transform their shoes into proper pirate boots, while teaching them how to sail the seas. As a pirate, good boots are important, as you will find yourself wearing them everywhere you go, for security and comfort. If you do not have good boots, have no fear, as these Classic Pirate Boot Toppers can solve that problem. 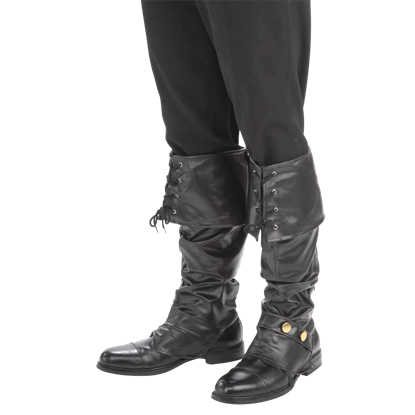 These black pirate boots feature a folded over cuff that tapers to a point in the center and also come with three different colors of ribbon for the side lacing. The ribbon is a feminine touch and adds a splash of color to your outfit. 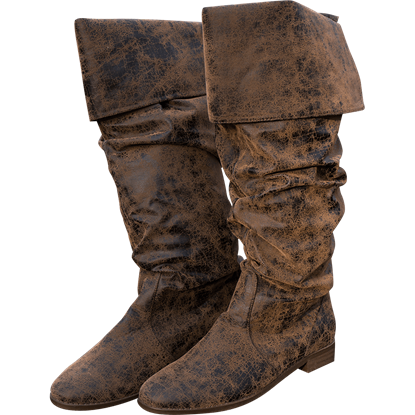 With their worn look, these Deluxe Buccaneer Boots will certainly make you seem like an experienced sailor who has been around more than a few pirate ships. In addition to their look, they also feature pirate decorations on their surface. Pirates spent virtually all day on their feet, so comfortable boots were something of a necessity. Luckily, you do not have to hunt down the same for your pirate look, because these Deluxe Pirate Boot Toppers work just as well! 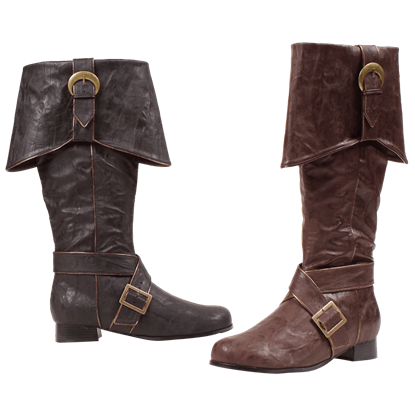 The Elegant Pirate Boots are perfect for any pirate wench! These synthetic leather boots feature a great gold heel and sole, a 4 inch skinny high heel, and buttons and lace on the cuff. Our Mens First Mate Boots are top quality footwear made from real leather. 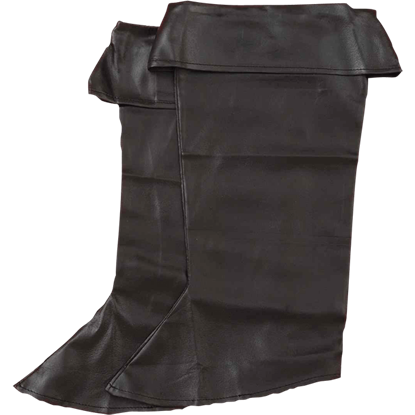 These leather Pirate Boots have the signature folded over cuffs and display a traditional style without modern zippers, perfect for any Buccaneer ensemble.